The accounting profession uses an “all inclusive” approach to measuring income. Virtually all transactions, other than shareholder related transactions like issuing stock and paying dividends, are eventually channeled through the income statement. However, there are certain situations where the accounting rules have evolved in sophistication to provide special disclosures. The reason for the added disclosure is to make it easier for users of financial statements to sort out the effects that are related to ongoing operations versus those that are somehow unique. The following discussion will highlight the correct handling of special situations. Errors consist of mathematical mistakes, incorrect reporting, omissions, oversights, and other things that were simply handled wrong in a previous accounting period. Once an error is discovered, it must be corrected. The temptation is to simply force the books into balance by making a compensating error in the current period. For example, assume that a company failed to depreciate an asset in 20X4, and this fact is discovered in 20X5. Why not just catch up by “double depreciating” the asset in 20X5, and then everything will be fine, right? Wrong! While it is true that accumulated depreciation in the balance sheet would be back on track at the end of 20X5, income for 20X4 and 20X5 would now both be wrong. It is not technically correct to handle errors this way. Instead, U.S. generally accepted accounting principles dictate that error corrections (if material) must be handled by prior period adjustment. This means that the financial statements of prior periods must be subjected to a restatement to make them correct. In essence, the financial statements of prior periods are redone to reflect the correct amounts. Global GAAP follows a similar approach but provides an exception for adjustments that are impractical to determine. The following 20X5 entry reveals the method of adjusting the general ledger for failure to record depreciation of $50,000 in 20X4. The debit to Retained Earnings reflects the expense that would have been recorded and closed to Retained Earnings in the prior year, while the credit to Accumulated Depreciation provides a catch-up adjustment to reflect the account’s correct balance. A company may decide to exit a unit of operation by sale to some other company, or by outright abandonment. For example, a computer maker may sell its personal computer manufacturing unit to a more efficient competitor and instead focus on its server and service business. Or, a chemical company may decide to close a unit that has been producing a specialty product that has become an environmental liability. When an entity plans to dispose of a component, it will invoke the unique reporting rules related to discontinued operations. To trigger these rules requires that the disposal represent a strategic shift with major impact on operations and financial resources. This would typically entail discontinuance of a major segment, unit, subsidiary, or group of assets that are clearly distinguishable operationally and for reporting purposes. 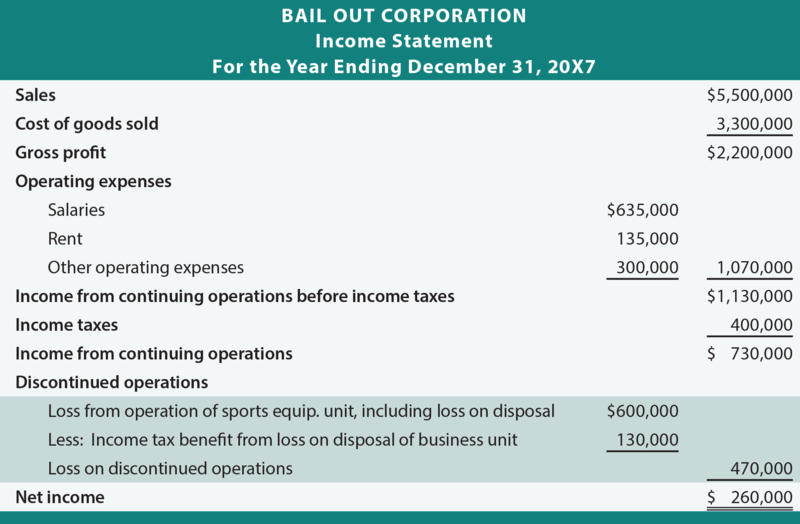 Following is an illustrative income statement for Bail Out Corporation. Bail Out distributes farming implements and sporting goods. During 20X7, Bail Out sold its sporting equipment business and began to focus only on farm implements. In examining this illustration, be aware that revenues and expenses only relate to the continuing farming equipment operations. All amounts relating to operations of the sporting equipment business, along with the loss on the sale of assets used in that business, are removed from the upper portion of the income statement and placed in a separate category below income from continuing operations. If material, a company may separate the operating gain/loss from the gain/loss on the actual disposal of assets within this section. 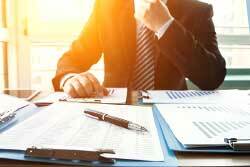 In addition to the shown modification on the face of the income statement, a company may also be required to provide extensive supplemental disclosures. These disclosures identify the disposal unit’s specific income statement impacts such as revenues, cost of sales, and so forth. Additional information may be provided explaining the discontinuation and detail impacts on assets, liabilities, and cash flows. 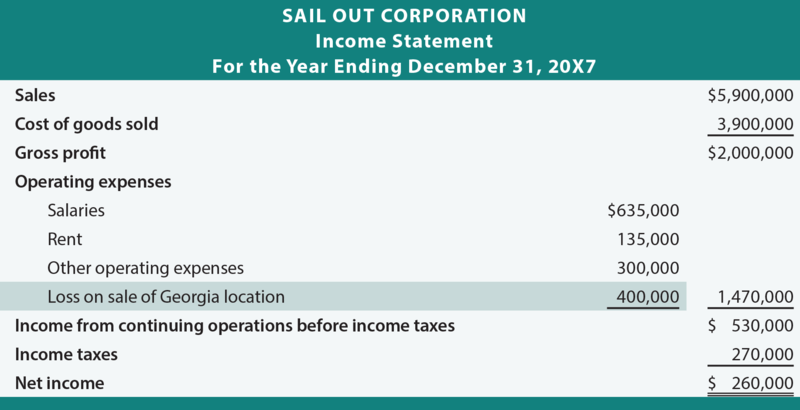 Look again at Bail Out and note that income taxes were “split” between continuing operations and discontinued operations. This method of showing tax effects for discontinued operations is mandatory and is called intraperiod tax allocation. Intraperiod tax allocation is applicable to other items reported below continuing operations (and some prior period and selected equity adjustments), but only one income tax number is attributed to income from continuing operations. The Long-term Investments chapter introduced other comprehensive income. OCI arose from changes in the fair value of investments classified as “available for sale.” OCI can also result from certain pension plan accounting adjustments and translation of the financial statements of foreign subsidiaries. OCI does not enter into the determination of net income or retained earnings, but it does enter into the determination of a broader concept of income. When OCI is present, it may be presented as a separate component in a statement of comprehensive income. Alternatively, a company may present a reconciliation of net income to total comprehensive income. 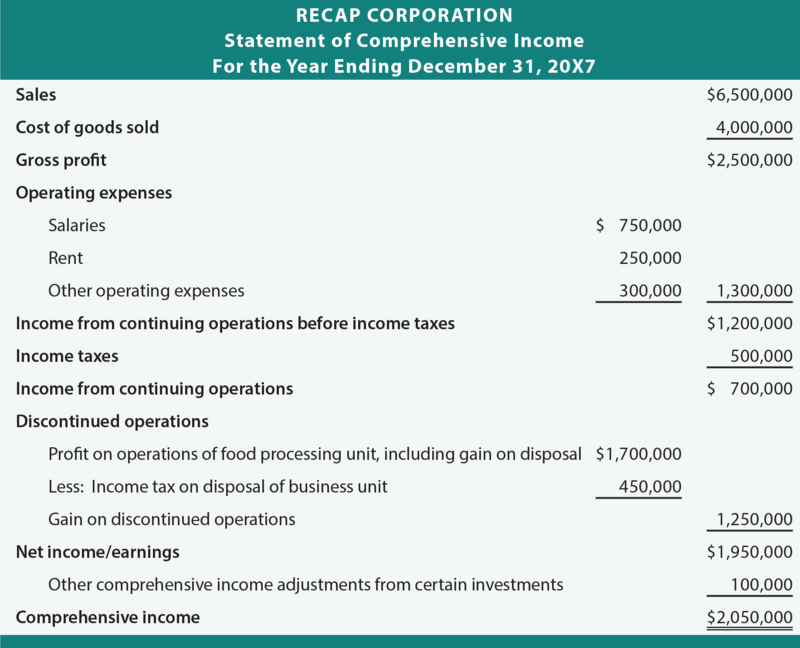 In the following illustration take note that net income or earnings is income from continuing operations plus/minus discontinued operations. Comprehensive income is net income plus other comprehensive income. OCI is closed to the Accumulated Other Comprehensive Income account that is presented within stockholders’ equity (similar to, but separate from, retained earnings). Additional reconciliations are sometimes necessary to more fully explain the detailed nature of specific changes in Accumulated OCI. A company may adopt an alternative accounting principle. 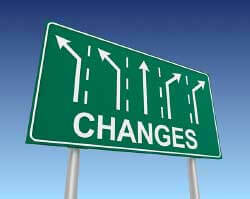 Such accounting changes relate to changes from one acceptable method to another. For instance, a company may conclude that it wishes to adopt FIFO instead of average cost. Such changes should only occur for good cause (not just to improve income), and flip-flopping is not permitted. When a change is made, the company must make a retrospective adjustment. This means that the financial statements of prior accounting periods should be reworked as if the new principle had always been used. Disclosures that must accompany a change in accounting principle are extensive. Notes must indicate why the newly adopted method is preferable. In addition, a substantial presentation is required showing amounts that were previously presented versus the newly derived numbers, with a clear delineation of all changes. And, the cumulative effect of the change that relates to all years prior to the earliest financial data presented must be disclosed. Do not confuse a change in accounting method with a change in accounting estimate. Changes in estimate are handled prospectively. This type of change was illustrated in the Property, Plant, and Equipment chapter. If a change in principle cannot be separated from a change in estimate, the adjustment would be handled as a change in estimate. Similar treatment is required for any change in depreciation method. Investors may discuss a company’s “earnings before interest and taxes” (EBIT) and “earnings before interest, taxes, depreciation, and amortization” (EBITDA). These numbers can be calculated from information available in the statements. Some argue that EBIT (pronounced with a long “E” sound and “bit”) and EBITDA (pronounced with a long “E” sound and “bit” and “dah”) are important and relevant to decision making, because they reveal the core performance before considering financing costs and taxes (and noncash charges like depreciation and amortization). These numbers are sometimes used in evaluating the intrinsic value of a firm, in that they reveal how much the business is producing in earnings without regard to how the business is financed and taxed. These numbers should be used with great care, as they can provide an overly simplistic view of business performance. What is a prior period adjustment, and when is this accounting device used? Know the journal entry and financial statement effect of restatements for errors. Identify the nature of discontinued operations. Know the special accounting treatment associated with discontinued operations. Describe intraperiod tax allocation, and state why this approach is used. Be able to prepare a comprehensive income statement. Know how to account for and report changes in accounting principle. Distinguish between the terms restatement and retrospective adjustment, knowing which is applicable to changes in principle. Be familiar with EBIT and EBITDA.